Petaling Jaya, Malaysia -- Paying homage to Lord Buddha at the temple and making offerings of lights and flowers were the order of the day as Buddhist devotees observed Wesak Day yesterday. << Seeking blessings: Devotees kneeling down as monks tie yellow strings around their wrists. Thousands of people made a beeline to the Subang Jaya Buddhist Association (SJBA) in Jalan Kewajipan, to celebrate what is regarded as the most auspicious day in the Buddhist calendar. Yesterday's celebrations started at 7am, although the observance of Wesak had begun on Sunday, when devotees and volunteers had gathered at the temple to light oil lamps and attend the Wesak Eve's Puja and Dhamma talk, before going in a procession around the temple and participating in all-night chanting and meditation. Devotees also joined in prayers at the temple's main shrine hall. A special puja service also conducted at about 9am while awaiting the official launch of the celebrations by guest-of-honour Datuk Tang See Hang, who has been SJBA's patron since 1990. Also present were special guests Kelana Jaya MP Loh Gwo Burne and Subang Jaya assemblyman Hannah Yeoh. SJBA president Chim Siew Choon said Tang had been instrumental in helping the committee secure the land to build the temple in 1992. “Our temple was registered with the Registrar of Societies (RoS) in 1988, so we are celebrating our 20th anniversary this year,” said Chim. Chim hoped the new state government would look favourably into the association's application to buy another piece of land. “We are considering maintaining the new land as a green lung and for the use of the Sunday Dhamma school children,” he said, adding that they would seek members' views at their upcoming annual general meeting before submitting their application. It is learnt that a bridge costing about RM1mil would soon be built near the temple to enable pedestrians to cross the busy Jalan Kewajipan. Yeoh, in her speech, said the state government acknowledged the lack of places of worship was an issue, and that a new committee had been formed under state health, plantation workers, poverty and caring government committee chairman Dr Xavier Jayakumar to look into applications by religious organisations. “The state cannot guarantee that all land applications will be approved but we assure you that we will consider everyone's request,” said Yeoh. Loh urged devotees to spare a thought for the victims of the cyclone in Myanmar and the earthquake in China even as they said their prayers. Tang said he was happy to see the temple had grown. He also commended SJBA for donating generously to the various charities. This year's Wesak Day organising chairman, Steven Quah, said the association had also organised a blood and organ donation campaign as part of its effort to promote a caring and sharing community. Chim also thanked devotees Leong Wai Keong and Vincent Chew, who had donated a two-room apartment in Port Dickson to the association to house members whenever there were activities there. Wesak Day is a time when Buddhists try to recall and aspire to emulate the great virtues of the Buddha – compassion, loving-kindness and wisdom. Devotees also renew their resolve to carry out more good deeds like charitable activities, observing morality, and practising mental cultivation to purify their minds. As monks later went around blessing devotees in the temple, a vegetarian lunch was served. In George Town, monks and thousands of devotees prayed and observed a one-minute silence for the victims of cyclone Nargis in Myanmar and the earthquake in Sichuan, China. The event was held at the Malaysian Buddhist Association in Jalan Burmah here. 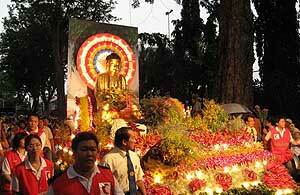 Later, Lim and Ong joined more than 10,000 devotees in a two-hour-long float and candlelight procession. More than 20 Buddhist organisations took part in the 7km procession, involving 23 floats which carried statues and images of the Buddha. Groups of young people performed cultural dances along the route. The theme for this Wesak is "Creating Harmonious Society with Compassion and Equality". In Kuching, Sarawak, Deputy Works Minister Datuk Yong Khoon Seng was among those who offered prayers at the Sarawak branch of the Malaysian Buddhist Association in Jalan Tun Abdul Razak. A lantern and float procession was also held in the city centre in the evening. It started and ended at Padang Merdeka. In Ipoh, some 4,000 devotees thronged the Enlightened Heart Buddhist temple in Ampang. The crowd was double that of last year and many devotees came from Johor Baru, Penang and Kuala Lumpur. Many took the opportunity to run under a 55.4m canvas painting of the Buddha, which is unique to the temple. The sunning of the painting follows a tradition in Tibet of the sunning of carpets to absorb the sun's power. Chief priest Ge Li Rinpoche, 68, said this was to rid them of bad karma. The celebration began with devotees bathing a statue of Buddha in a pond.